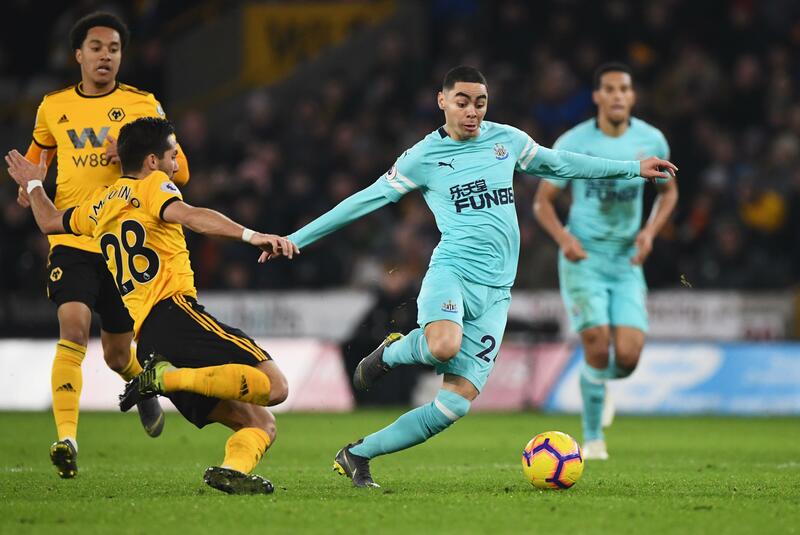 Miguel Almiron may have only enjoyed a brief cameo against Wolverhampton Wanderers, but he appears to have done enough to convince some Newcastle United fans. The former Atlanta United midfielder, who made the switch from MLS during the January transfer window, replaced Christian Atsu at Molineux to an absolutely incredible roar from the 2,400 travelling fans. Willy Boly’s last-gasp equaliser rescued a point for Wolves to dent Newcastle’s survival hopes as the game finished 1-1. The defender nodded in deep into stoppage time – although the Magpies wanted a foul on goalkeeper Martin Dubravka. However, boss Rafa Benitez will be delighted to see how fans have taken to Almiron already. Premier League yellow and red cards: Who faces a ban soon? Check out the best Tweets below! Almiron going for the ball with his head while lying on the floor in the dying minute tells me all I need to know about his commitment. Miguel Almiron has been on the pitch 5 minutes and he looks like the best player Newcastle have had for years! That’s a massive kick in the balls, but we’d have taken a draw at the start. Longstaff unbelievable tonight. What a player. Ayoze, Rondón and Lascelles brilliant too. That run from Miguel Almiron. My god. They’re gonna love this dude. You could see Almiron’s passion on the pitch, he knows that playing for this club is massive and to have a manager like Rafa is a blessing! Almiron has to start against Huddersfield simple. One of the positives from tonight was Almiron. He looks rapid on & off the ball. Always positive and looking to go forward & attack. Next Gary Lineker: Arsenal didn’t have the squad to compete under Arsene Wenger… so what’s Unai Emery supposed to have done?